Please Note: Aboriginal and Torres Strait Islander people should be aware that this post contains names of people who have passed away. 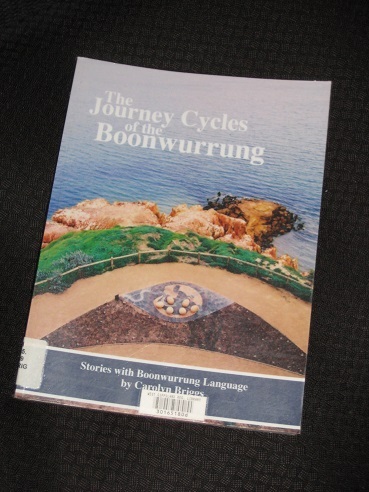 The Journey Cycles of the Boonwurrung, a short work written by Carolyn Briggs, provides information about the history and language of the Boonwurrung nation, one of the indigenous peoples of Victoria. They are one of five groups that made up the greater Kulin nation, watching over the coastal area of south-eastern Melbourne, and where I currently sit used to be located close to the border with the Wurundjeri (or Woiwurrung) nation, whose language shares around 90% of its vocabulary with Boonwurrung (sometimes called Bunurong). The main part of this book consists of brief prose texts describing different elements of Boonwurrung life, from the annual cycle of hunting and gathering to stories handed down from their ancestors, while also describing the nation’s reaction to the arrival of Europeans at the start of the nineteenth century. From the start, there’s a clear environmental focus to Boonwurrung life, and the writer describes in detail the annual cycle of managing the flora and fauna, both for the good of the land and to maintain food supplies. The people were guardians of the natural resources in their nation and were empowered to prevent exploitation when stocks of murnong (yam daisy), gurnbak (fish) or guyeem (kangaroo) ran low. By carefully monitoring the use of natural resources, they thus ensured a perpetual supply of food and a healthy environment. An example of this approach to environmental management is the way the people caught the eels that went down the Yarra river (or Birrarang) in the autumn and back up from the bay six months later. In this vision, they had seen a time of great crisis. They had seen that these visitors had come, and not left. They saw that these visitors would break many laws of Bundjil: killing animals but not eating the meat, destroying the murnong crops, damming the wurneet (creek or river) and stopping the iilk (eels) from breeding. The wurneet would turn from guyang (blue) to yaleen (brown) and wiiny (fire) would rain down on their birrarang-ga (country). They saw death and pain for their people. All of which, for anyone with a passing knowledge of Australia history, was fairly prescient… The second vision, however, foretold reconciliation and a return to traditional ways of caring for the land. The Australian government has made steps towards land rights as well as making an official apology to Aboriginal people in 2008, and there’s certainly recognition of a need to change how we interact with the environment. Still, there’s a long way to go before the elders’ second vision is truly fulfilled. Other sections of the book consider the devastation wrought by what indigenous people still see as an invasion on a more personal level. Briggs tells the story of Louisa Briggs, a woman kidnapped in the 1830s by sealers. She lived to be over a hundred years old, and having eventually made her way back to Victoria, she was able to tell of her experiences and pass on some of her people’s culture. There is also a section discussing Derrimut and Benbow, the last artweet (clan leaders) of the Boonwurrung people, who passed away in the middle of the nineteenth century, still struggling for acknowledgement of their traditional land rights. Carolyn Briggs: So we’ve created white man’s symbols, taking ownership into a black form, by creating a word and then transferring it back to English. Cristina Eira: How is it transferring back to English? Carolyn Briggs: Well once we’ve claimed it and written it, you have black way and white way. So you’re writing the language in the symbols, white symbols, alphabet meaning, and producing it from the word, from English, back to Aboriginal language and then back to English again. It’s a tall task, an attempt to codify the language for subsequent generations using documents left by early linguists and whatever remains in the memories of older members of the nation. Once the female barraeemal laid her teerandeerr she would trot off – looking for another old man barraeemal to flirt with. She knew she could do this because for at least the next six months her husband would be busy minding the nest and raising the chicks. The Journey Cycles of the Boonwurrung is a short but fascinating book, allowing outsiders to follow the annual cycles of the Boonwurrung people as they moved around their nation. Perhaps a more important journey, though, is that undertaken by Briggs and other representatives of her people in their attempt to recover their language and culture. This book is one of the first steps along a lengthy road – let’s hope the journey is a successful one.